To understand what director Jonathan Demme does so well with Justin Timberlake + The Tennessee Kids, watch just about any other concert film. For the most part, the stodginess of the form is stupefying. Cameras stay trained on the lead singer from multiple angles, with frequent inserts of the backing band and audience, for just a few seconds at a time. One song gives way to the next, all shot and cut nearly exactly the same way. The musicians have to work to keep viewers engaged, overcoming framing and editing that rarely shows them to their best advantage. In one of the most exciting scenes in The Tennessee Kids, Timberlake and his band are lined up at the front of the stage, playing a bluesy version of “Drink You Away.” Demme and cinematographer Declan Quinn move the camera slowly back and forth down the row, giving every musician a chance to be the star of the show, while also building tension for who and what will appear in the shot next. The music’s outstanding. Demme’s way of presenting it is absolutely riveting. Justin Timberlake + The Tennessee Kids was filmed on January 2, 2015, at the MGM Grand in Las Vegas, on the last night of a mega-grossing two-year arena tour. This is a different kind of concert than any that Demme’s documented before. It’s a massive production, with a teeming ensemble that includes backup dancers and a stage show that incorporates lasers, film clips, and a glass catwalk that moves over the audience. Rather than getting overwhelmed by the razzle-dazzle, Demme weaves between three distinct assignments: capturing one of the most popular live acts of the 21st century; paying due respect to all the unsung people who help make Timberlake’s magic happen; and showing even the singer’s diehards something they wouldn’t have seen from the crowd. 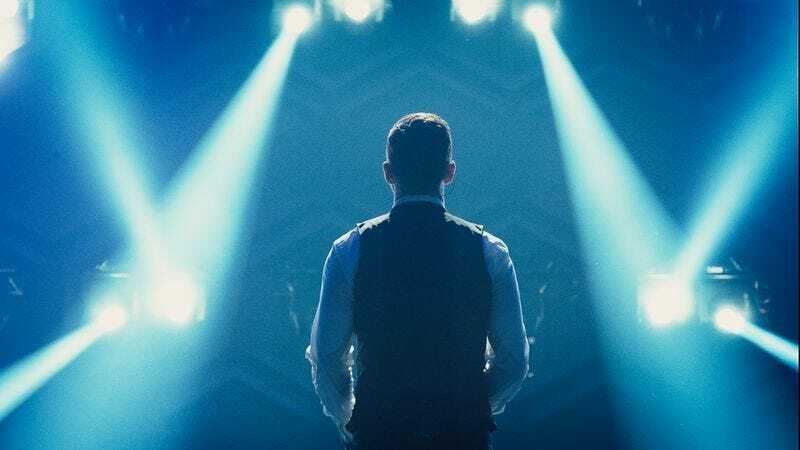 Fans of Demme’s other concert films—most of which feature acts that could reasonably be called “hip”— may be skeptical about spending 90 minutes with a polished pop product like Timberlake, no matter how talented and personable he may be. And musically speaking, there’s a bombast to The Tennessee Kids that’s noticeably different from something like Demme’s Neil Young collaborations, which make a virtue of minimalism. But the director manages the spectacle—and the dozen or so musicians—by breaking them down into component parts. At times he isolates the percussionists in the frame, or the horn section, or the guitarists, watching them work their groove with genuine abandon. He asks the viewer to listen carefully, too, via a subtly dynamic sound mix that makes the individual instruments stand out a bit more when they’re on the screen—almost as though we’re actually standing next to the band whenever we see them. Meanwhile, Demme keeps finding something new and unusual to shoot, fascinated by the minutiae and peripheries of a major showbiz endeavor. When Timberlake and his dancers are spinning tightly on their narrow elevated walkway, the camera moves below them to reveal the gears that keep the set moving. When JT is crooning a cover of Michael Jackson’s “Human Nature” atop a bar among the crowd, he’s positioned in such a way that the bartender is stuck in the shot, awkwardly (and endearingly) watching the performance. These aren’t flashy stylistic flourishes. They’re small touches that make Justin Timberlake + The Tennessee Kids more lively and unpredictable, while also celebrating—completely uncynically—some of what goes into entertaining tens of thousands of fans every night. Timberlake himself is a stunner, whether he’s smoothly pirouetting his way through “Suit & Tie” or he’s choking back tears during his stirring set closer “Mirrors.” But his team is well-matched by Demme’s, who flash back during the closing credits to convey the phenomenal feat of engineering that was the assembly of The 20/20 Experience World Tour stage. No frame of this film is wasted. Demme is always looking for another chance to tell a story.